Full fermentation bins! A walk inside Owen Roe Winery at Harvest. 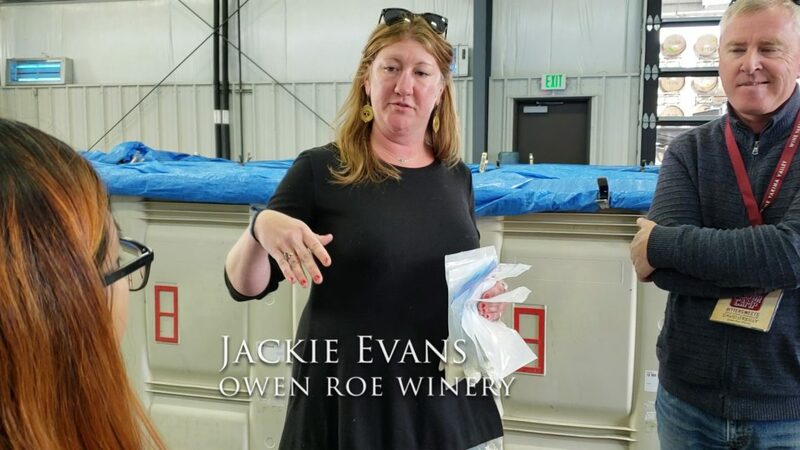 While we were in the Yakima Valley for #WBC18, we had the opportunity to go to Owen Roe Winery with the Pre-Conference Tour with Wine Yakima Valley. You can read all about Day 1 of our adventure in the Yakima Valley here at Yakima Valley Wine and Beyond with Wine Yakima Valley’s Flavor Camp. While enjoying our afternoon, tasting the wines and getting set for Flavor Camp, I peeked around the side of the winery, where work continued. We were deep into harvest and cleanup was happening outside the winery, behind where the tables were set out for dinner and wine was being poured. I always lean toward the backstage (I am a Stage Manager after all), so I snuck around the side and found a couple fellow wine writers peeking as well. As luck would have it, David O’Reilly, owner of Owen Roe, had spied us, and offered to give us a tour inside the busy working winery. The Winery was full of bins filled with fruit that was fermenting. Pulling back the tarp, that was spring clamped on as a lid, we looked in at the berries (grapes) that looked remarkably like blueberries (as someone noted). David informed us that this was a whole berry ferment. They don’t use a crusher to crush the berries, the weight of the berries pressing down on each other does that work for them. The room was filled with these white bins full of berries fermenting. Someone asked if this was like a carbonic ferment. 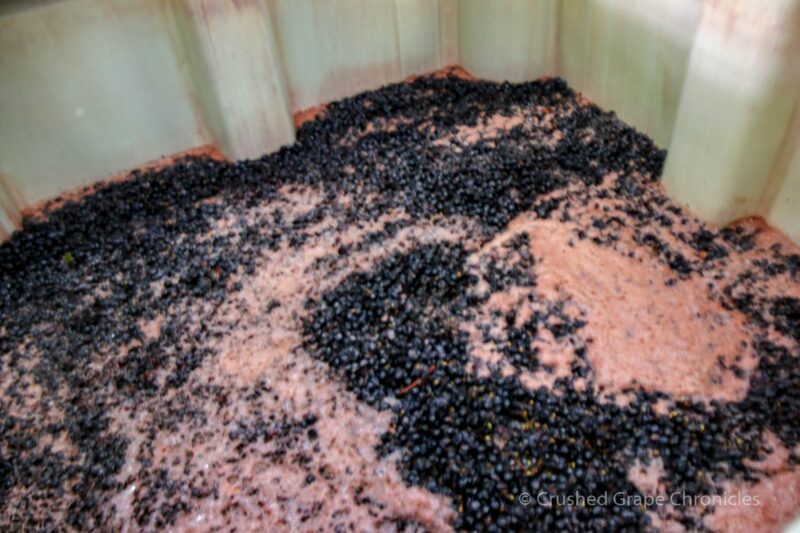 Well….carbonic fermentation (as David explained) is a whole berry fermentation like this, but….it is done in an enclosed system with CO2. 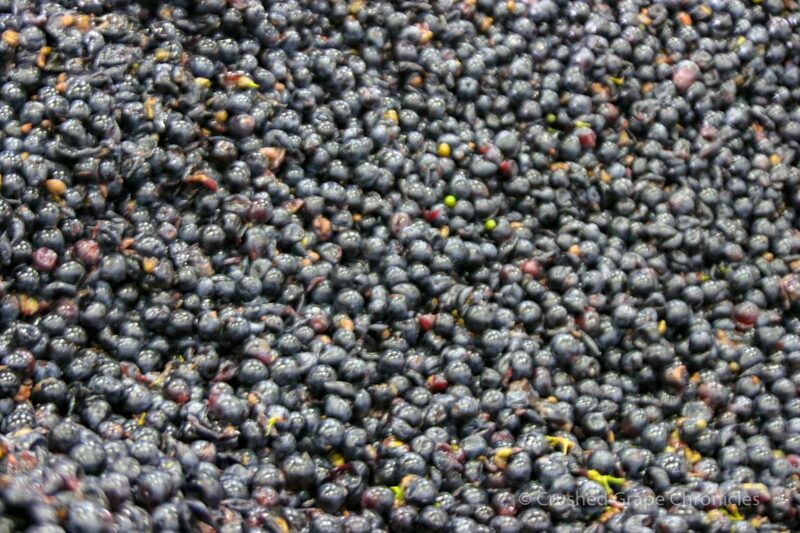 They do this with the Cinsault that goes into their Sinister Hand Blend. He pointed out the room in the corner, their cold room. The carbonic masceration, does with the Cinsault, what is does with Beaujolais Nouveau, it give the wine a fresh fruit note. You know I love a good story. 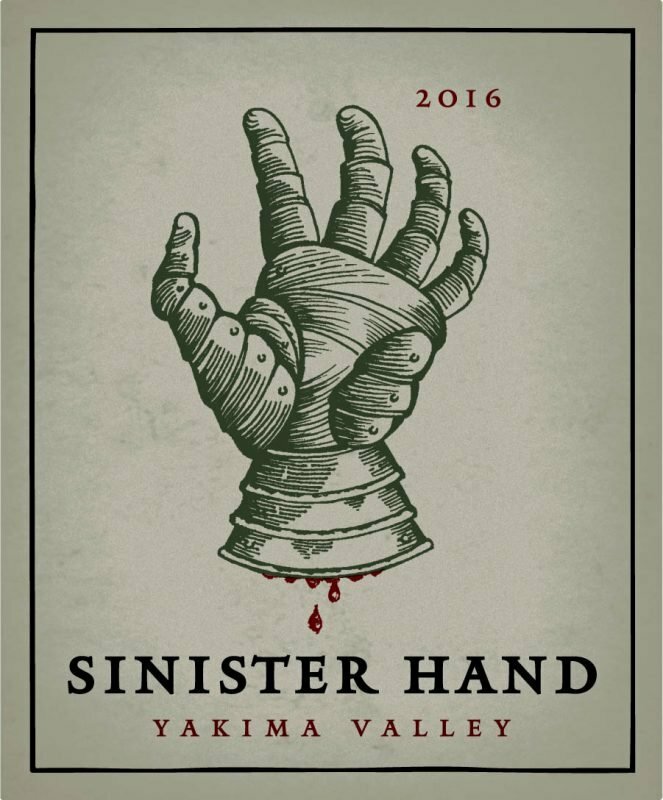 While David O’Reilly told us the tales of the winery and the vineyard, I dug a little deeper to find the inspiration for the name of the Winery and beyond that, of the Sinister Hand wine that David mentioned to us and that I got to taste later. Owen Roe O’Neill was a seventeenth century Irish Patriot, who dedicated his life to upholding the highest principles of political equality and freedom. His commitment to great things makes him an ideal model for us at Owen Roe, for we share his dedication to principle in our work to produce the wines of Owen Roe. At Owen Roe we do not compromise: only the best is good enough. I reached out to Taylor at Owen Roe and she told me that David O’Reilly had spent his first 14 years of life on a farm in Ireland. His family then moved to British Columbia and he fished and raised vegetables and grew up living off of the land. A letter written in 1649 by O’Neill was found in David O’Reilly’s family castle, but because the letter was written in Spanish, O’Neill penned the signature with his Spanish name. David cut out the letters from the document to create Owen O’Neill’s signature. O’Reilly is related to O’Neill through marriage. THE STORY BEHIND THE LABEL: Long ago, pre-dating the 11th century, the families that became modern day O’Neills and O’Reillys were feuding over the land that became their ancestral home. To settle the dispute, a competition was organized and several rowing teams agreed that the first to touch the land, after rowing across the lake, would become ruler of the land. O’Neill’s boat was falling behind so a member of the crew grabbed his own sword, cut off his hand and threw it ashore, and touching first, winning the title to rule the land. The island fortress on this land can still be visited on Lough Oughter in County Cavan. David opened up a bin that was about half way through its ferment. You could feel the heat. The bin was sitting at about 32 ° C that would be about 85 ° F. David explained that with Interns in the winery from all over the world, they use celsius temperature and metrics here (easier than teaching another language!). We looked in another bin and you could see some skin separation. The color was also leaching out of the skins into the juice adding those wonderful phenolics that make red wines so tasty and interesting. When asked about regulating temperature, David said that they regulate the ambient temperature in the winery. We had arrived at the change of seasons, when the daylight temperatures tend to plummet. Often it is actually too cold for fermentation in the winery. They do have their cold room in case a fermentation gets running too hot. They typically keep their fermentations at around 80 ° here and let them do a nice slow 2 week fermentation. Later in the evening the crew would be in for punch downs. I had planned on trying to get back in to see that, but the wine, the food, the conversation, and that sunset…well, suffice to say, I got distracted. None the less, we did go on to do our Flavor Camp which included a vineyard tour with David. You will see that coming up next! Open Daily from 11-4 in the Yakima Valley, they do require reservations for more than 8 guests. They also offer Barrel Room Tastings on the weekends started each day at noon. You can reserve this for a fee on their reservation page. It includes a tour, private tasting, an expanded flight and a cheese and charcuterie platter. Again open daily from 11-4 their tasting room off Hwy 219 outside of Newberg requires reservations for more than 6 guests. You can bring snacks, or contact them ahead of time and they can have a snack plate ready. Here they have a Cellar Table Experience that you can reserve to do a more private tasting geared toward your palate. Contact them ahead of time to set this up. Watch for our vineyard tour with David O’Reilly, coming out soon! 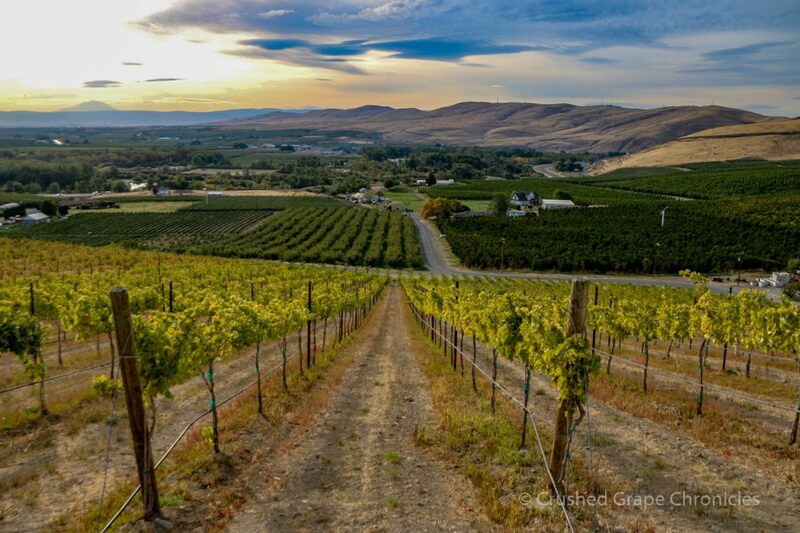 And visit our Yakima Valley Wine page on our site for more details on this great region. 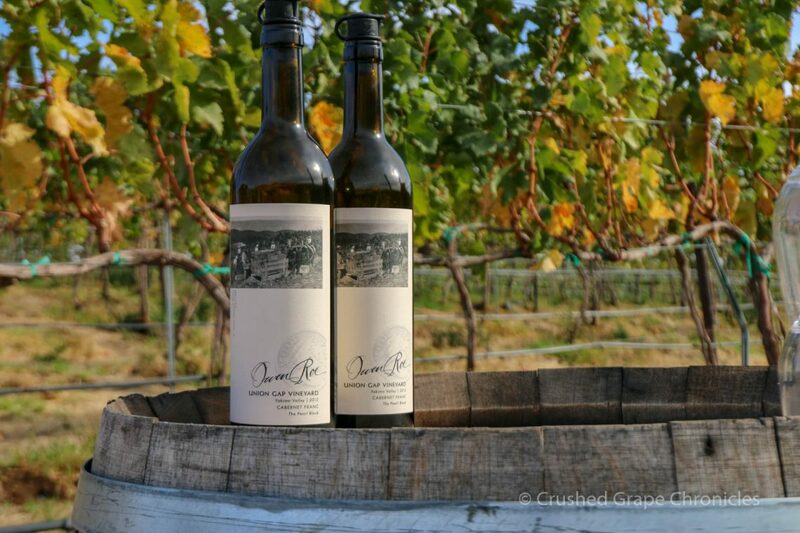 We have been fans of Owen Roe for a long time but have yet to visit in person. Like you we love to find the story behind the wines and what a crazy story that is — clearly they wanted to win that race badly!? Ah the Irish…just a little competitive. I love that David, as an O’Reilly is related through marriage to the O’Neils. So obviously there was some sort of reconciliation. That’s some serious dedication to win the land. I don’t know how I feel about that label. It’s definitely eye catching, but also a bit on the gruesome side with that blood dripping. Interesting that they use a full berry fermentation. It looks like there are even stems mixed in. So they must not use a sorter to separate the berries and stems either? I’d think that would give some bitterness and bite to the wine. Maybe it’s different when the berries haven’t been crushed first. Another great visit! Interesting to learn more about that Owen Roe name!